Growing up I didn’t have a good relationship with food, and thus I struggled with a lot of health issues due to eating very little and consuming low nutrient foods. I ate a very unbalanced diet, which was high on sugar, unhealthy fats, and processed foods and very low in protein and carbohydrates. When I moved out of my parent’s house and started living alone, the only thing that I knew how to cook, was to boil pasta and open a can of something(if you count that as cooking). Moving abroad and starting to live alone wasn’t an easy thing to do, and being a university student with a lot of work and stress didn’t help either. I didn’t pay much attention to what or whether I was eating, a cooked and healthy meal was something I could have only had in my dreams. And quite often I did, I dreamt of the smell of freshly baked pie or homemade waffles, that my mother used to make. But in reality, all I was left with, was tons of canned food, pasta, lots of sweet cakes, Nutella( which I used to eat it straight from the jar, with a big spoon, as my breakfast!) chocolate and yes an uncountable number of marshmallows bags. So my diet, as you can see wasn’t exactly healthy, in fact, it was very far from healthy, but at the time it didn’t bother me, I didn’t pay attention to it because I thought that it doesn’t matter what I eat as long as I eat! HOW WRONG WAS I? I endured one year of this lifestyle, and during my second year of university, my body started to show the first symptoms started having very bad stomach aches and terrible digestive issues. That really made my appetite to decrease thus bringing more issues such as feeling extremely fatigued, having constant headaches, and difficulties to concentrate, eating less thus losing a lot of weight and feeling extremely weak. I was struggling to do the simplest tasks. At first, I didn’t know what was happening to me, I wanted to believe that it will go away by itself, but it didn’t! It only got worse! Later that year ( autumn 2014 ) the symptoms got severe, and I had to stop with all my tasks. 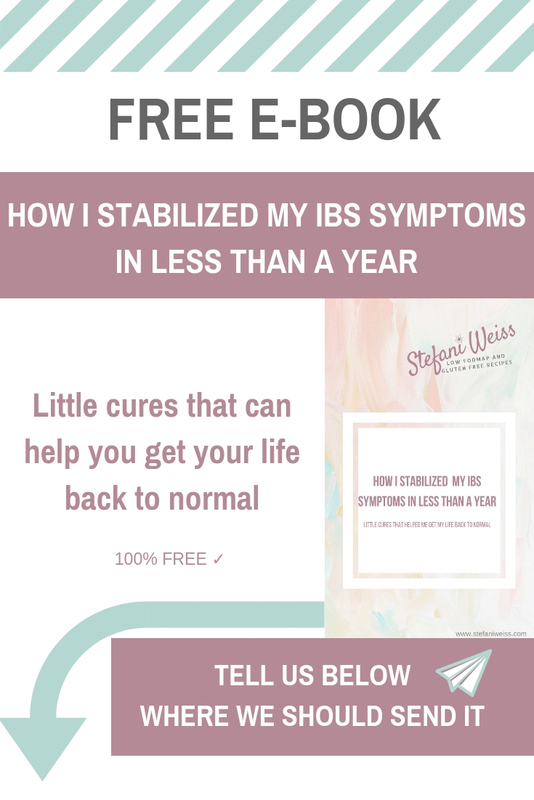 After doing various tests and visiting different doctors I was diagnosed with IBS and gluten intolerance. That was the moment when my life changed completely. At that point, my immune system was very weakened. My mental health suffered as well; my anxiety worsened, which lead to experiencing frequent and terrorizing panic attacks. All of these things made me feel very unhappy and unsatisfied with my life. All those torturous symptoms forced me to start looking more into my lifestyle and diet. Because of the IBS, I had to change my diet. My doctor introduced me to the Low FODMAP diet. I also had to stop eating gluten and lactose completely. The Low FODMAP diet helped me a lot in stabilizing some of the most tortures symptoms I had from the IBS. However, the Low FODMAP diet on it own wasn’t sufficient to get my IBS in control. Eating healthy and wholesome ingredients, together with changing my lifestyle was incredibly important in stabilizing my IBS. Suddnly being cut off of all those delicious things (like croissants, pies, pizzas, and bread) yeah those were my favorite foods and being introduced to this Low FODMAP diet, which at the time seemed very boring made me feel pretty depressed. But, all that also made me get more creative in the kitchen and later inspired me to share all that creativity here. And trust me, one thing I learned is that having IBS or food intolerances, following Low FODMAP, taking care of your body by eating wholesome and healthy ingredients, DOES NOT MEAN EATING A BORING DIET! IT REALLY DOES’T!